Sarah Bush Johnston Lincoln (December 13, 1788 - April 12, 1869) was the second wife of Thomas Lincoln and stepmother of President of the United States Abraham Lincoln. Thomas Lincoln had met Sarah while living in Kentucky. After his first wife, Nancy Hanks, died in 1818, Thomas married Sarah on December 2, 1819 and brought her and her children to his farm in Indiana. 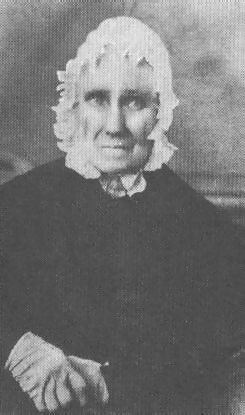 She treated the two children from Thomas's first marriage the same as her own, earning the lasting affection of Abraham, who always addressed her as "Mother." She encouraged his appetite for reading and learning. He visited her "every year or two," and was apparently closer to her than to his father. After Thomas died, Lincoln maintained the family's farm in Coles County, Illinois for her and supported her until his death. Their final visit occurred on January 31 and February 1, 1861, just before Lincoln left Illinois for the White House. Lincoln's legendary sense of humor was probably influenced by his stepmother. He recalled that she was a firm but kind-hearted woman who loved to laugh. When he was eighteen years old, Lincoln, at 6' 4", was so tall that his head nearly touched the ceiling of the family's farmhouse kitchen. His stepmother repeatedly joked that Lincoln was so tall that she was afraid he would leave footprints on her ceiling. Lincoln decided to have some fun with this idea. One day, when his stepmother was not home, Lincoln got together a group of younger boys and had them dip their bare feet in the mud outside the farmhouse kitchen. Then Lincoln took each of the boys inside, held them upside-down, and had them walk their feet across the ceiling, leaving muddy footprints. When Sarah Lincoln saw the muddy footprints on her ceiling, Lincoln recalled, she "took a broom to my head, but I could tell she was very amused by it." The homestead where she and Thomas lived is preserved as the Lincoln Log Cabin State Historic Site. Sarah is buried next to Thomas in nearby Shiloh Cemetery, just south of Lerna, Illinois. Sarah Bush Lincoln Health Center in Coles County was named after her. Abraham Lincoln's stepmother, Sarah Bush Johnston Lincoln, was born in Elizabethtown, Kentucky and came from a flourishing family. Her father, Christopher Bush, was "…a stirring, industrious man, and had a large family of sons and daughters." In March 1806, she married Daniel Johnston. Unfortunately, Johnston did not have the same kind of industriousness that his in-laws had and he was soon deeply in debt. When he died in 1816, Sarah was left with many of these obligations still outstanding. For the next several years she did her best to support herself and her three children. In 1819, Thomas Lincoln returned to Elizabethtown, a widower himself by this time, with hopes of finding a new wife and mother for his children. Having known Sarah before he moved to Indiana, and knowing she was a widow, he paid her a visit and asked her to marry him. Sarah replied that she could not marry him until she had paid her debts. Upon hearing this, Thomas agreed to pay the debts himself. Once that was done, he and Sarah were married on December 2, 1819. Sarah and her three children, John, Matilda, and Elizabeth returned with Thomas to Indiana, where Sarah set about making the two families into one. She found the country to be "wild and desolate" but the log cabin that Thomas had build was "good, tolerably comfortable." She soon discovered that her new stepson was very intelligent and had a passion for knowledge; he was especially fond of reading. Consequently, her gift to him of three books left an indelible impression on him. Not only was it a priceless treasure to a boy who loved to read on a frontier where books were scarce, but it was an indication to him that Sarah would pick up where his mother had left off in terms of encouraging his quest for knowledge. The two quickly developed a close, intimate, mother-son relationship that would continue for the rest of Abraham's life. Even as an adult, Abraham remained close to his stepmother, whom he always referred to as "Mother." After the family moved to Illinois and he had gone out on his own he still found time to visit. Mrs. Lincoln reported that she "saw him every year or two." After the death of his father in 1851, Lincoln retained a 40-acre plot of land in his own name "for Mother while she lives," and otherwise tended to her welfare as best he could from a distance. Abraham saw his stepmother for the last time when he visited to bid her farewell before going to Washington for his inauguration. When she later recalled the visit after her stepson's death in 1865, she wept. Sarah died in 1869. Lincoln said of his stepmother "she proved to be a good and kind mother" to him. By all reports their relationship was excellent, and Mrs. Lincoln considered her stepson a model child who was always honest, witty, and "diligent for knowledge." He never needed a "cross word." In all the vast literature of controversy over Lincoln's early years, there is hardly an unkind word about Sarah Bush Johnston Lincoln.